But I was expecting, as also mentioned in that invitation, a private business luncheon for more dialogue and interaction, but today, this ballroom is filled up with almost 300 guests, and all the electronic media are there, and somehow because of the date chosen, which is less than two weeks since I announced my maiden Policy Address, the event was now described as one for me to discuss the reasoning behind my first Policy Address and for guests to know more about my blueprint for improving Hong Kong's competitiveness in the years ahead. Despite the changes in the theme of the luncheon and the attendance, I am equally thankful for the opportunity to share some thoughts about Hong Kong's future with our Canadian business community. However, I should just add that the convention remains of the Chief Executive to attend a Joint Business Community Lunch hosted by several local chambers after the annual Policy Address, and this year it will take place on October 31. I hope to see some of you there as well. Hong Kong and Canada share many close links, and one of which is the day of July 1, which marks our anniversaries. And the year 2017 is particularly memorable as Hong Kong is celebrating her 20th anniversary as a Special Administrative Region of the People's Republic of China, while Canada is turning 150 years old as one of the great nations of the world. And let's not forget our good host, the Canadian Chamber of Commerce, now 40 years into making things happen for Canadian business here in Hong Kong. I am told that your membership, Lawrence, counts some 900 business people, making CanCham among the largest Canadian business organisations outside Canada, and certainly one of the busiest, most influential international chambers in Hong Kong. We like to do business together. 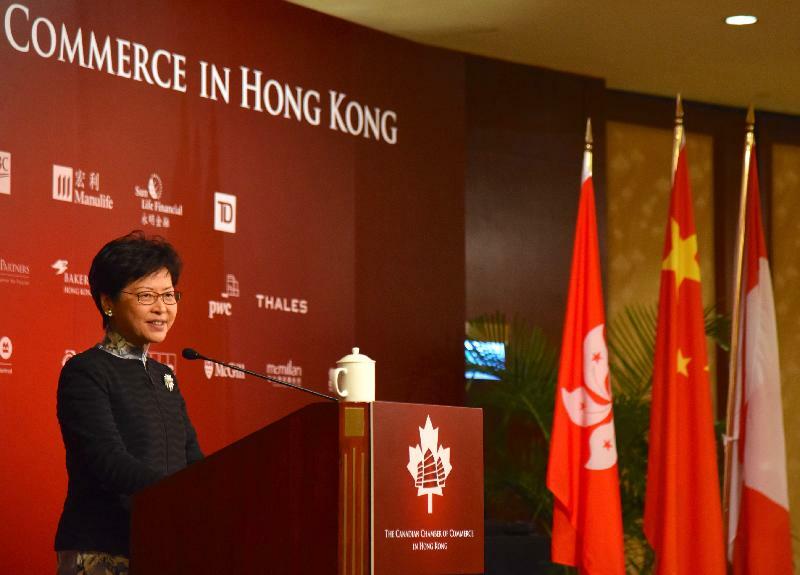 Last year, our bilateral trade was valued at C$4.7 billion (HK$30.3 billion). In 2016, Hong Kong was Canada's eighth-largest export market, with food taking a big bite of that. Indeed, Hong Kong was Canada's largest export market for frozen beef, fourth-largest for fish and seafood. 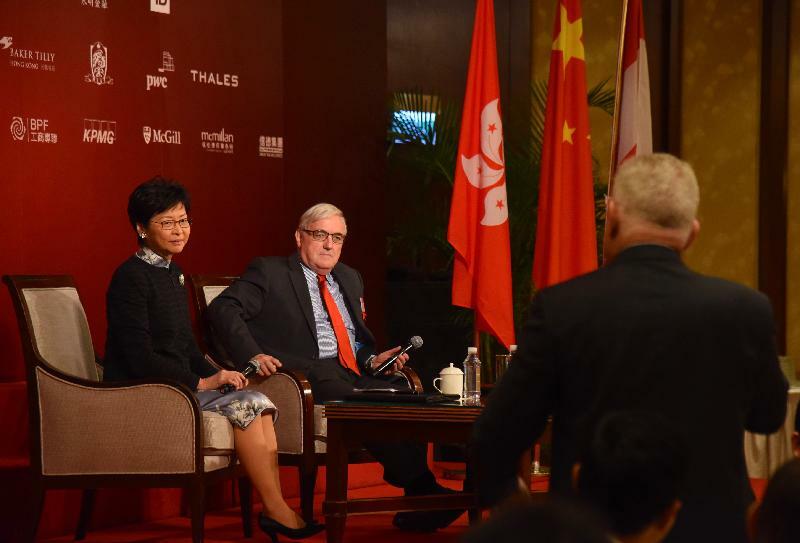 Hong Kong is also a large source of investment for Canada. Foreign direct investment from Hong Kong to Canada was C$12 billion (around HK$76.8 billion) in 2016. While our relationship is already close, I'm confident that our trade, and our investment in each other's economies, will only grow in the coming years. And this is what I want to talk about from my Policy Address delivered on October 11. Hong Kong's unique advantages under "one country, two systems", our core values featuring the rule of law, the independence of the judiciary, the free flow of capital and information, etc, our geographical advantage and free and open market make us one of the most competitive economies in the world. Canada's own Fraser Institute has named Hong Kong the world's freest economy every year since its first "Economic Freedom of the World" report came out, more than 20 years ago. Nevertheless, with intensified competition from other regional and global economies, there is no room for complacency. With the rise of protectionism, challenges are even more pronounced. We - the Government and the business community - must therefore strive for innovation and develop a high growth and more diversified economy. We must seize opportunities from the Belt and Road Initiative, as well as the Guangdong-Hong Kong-Macao Bay Area development, to inject new impetus into the development of our traditional industries that have enjoyed distinct advantages and identified new emerging economic sectors. Instead of going into the detailed plans of my government to consolidate and enhance individual economic sectors, I would like to use the next few minutes to explain how we the Government intend to do it. First, we all know that the convention and exhibition industry is crucial to Hong Kong as an international centre for trade and commerce. By attracting world class and the most prestigious international conventions and exhibitions to Hong Kong, we have reinforced our position as an international hub. Many large-scale fairs and shows now organised in Hong Kong are the largest in Asia, or even the world. But the shortage of space is a pressing concern. For example, I visited the Electronics Fair (Autumn Edition) organised by the Hong Kong Trade Development Council earlier this month, which is the largest in the world. The fair has taken up all available space at the Hong Kong CEC (Convention and Exhibition Centre) and probably with some exhibitors turned away. The second example I want to give is our commitment to strengthen our bilateral and multilateral ties with the Mainland and overseas countries. We should make full use of Hong Kong's high degree of autonomy in conducting her external affairs as provided for under the Basic Law with a view to open new markets, attract more enterprises and talents to Hong Kong, and strengthen Hong Kong's position as an international trade, commercial and financial centre. Relevant bureaux and departments have been given the clear mandate to negotiate for more FTAs - that is free trade agreements; IPPAs - investment promotion and protection agreements; and CDTAs - comprehensive agreements on the avoidance of double taxation. Noting that people-to-people bond is of no lesser significance, we are similarly eager to establish bilateral co-operation in arts and culture, education and youth activities. In this respect, I am confident that the Investment Promotion and Protection Agreement between Hong Kong and Canada which came into effect a year ago will usher in greater co-operation between our two economies. My third example, which should be music to your ears, is our plans to reduce business' tax burden. As noted in the Policy Address, we will launch a two-tiered profits tax system. We will lower the profits tax rate to 8.25 per cent - that is half the current rate - on your first HK$2 million in profits. Beyond that, the standard profits tax rate of 16.5 per cent will remain unchanged. In short, Hong Kong's already low tax rate is destined to get a good deal lower, which can only attract more Canadian companies, entrepreneurs and start-ups to Hong Kong. We are keen, as well, to build a world-class innovation and technology sector. A healthy research and development environment is central to that goal. In my Policy Address, I proposed that the first HK$2 million in eligible R&D expenditure should enjoy a 300 per cent tax deduction, with a 200 per cent deduction for the remainder. I have said on many occasions that we cannot take pride in our economic progress if our people do not share the benefits. The extent of discontent and frustrations in society arising from disparity between the rich and the poor and the lack of social mobility for the younger generation are warning signals to government. Hong Kong is no exception. In my Policy Address, I have announced plans and allocated resources for education and many social programmes in housing, health care and social support. I want Hong Kong - this city we call home - to be not only competitive, but also compassionate.